Put your political views aside for a moment. Today was a great day for America. Today saw the first non white President sworn into the White House. That feat, 60...50...40...30..20 years ago would probably almost seem impossible. Today it was achieved. President Obama conducted himself with dignity and class today. I pray that the Lord just lead this new leader of our country in His ways. Many have asked me where I think Obama stands in his Christian beliefs. I am asked how can we support a man who show's little respect for the unborn child, no value for it's life yet declares his Savior is our Lord Jesus Christ???? Is that what Jesus would do? That is a tough question. That is normally followed by some claim that he is Muslim, a Terrorist, a Communist.....This is tiring me! These are comments from Christians who are straight up judging a fellow man! So what if he was raised a Muslim! Jesus saves! George Bush was an alcoholic and you know what? Jesus saves. News Flash - You and I are both sinners and you know what? Jesus Saves. Obama is doing what he believes is right for this country and best for it's people just as Bush did. I applaud that. I really do. Do I disagree with him in some areas? Sure I do (I value the unborn child but I also value the innocent victim who was killed in areas of war that could have been avoided) But I also I agree with him in many areas. Today we have seen one man take over the reigns of our country from another man. Both of these men claim Jesus as their Savior. I believe that. That doesn't mean they haven't and won't make mistakes. They are men! Sinful men like us all! That is why Jesus came! They have tried and will try their best. If they seek the Lord first in all they do...this country will be greater than any of us ever imagined. That is my prayer. 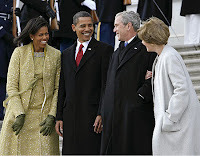 Thank you George Bush for your efforts and here is to supporting Barack Obama and believing he will serve his term in Faith. Kudos James! I completely agree! 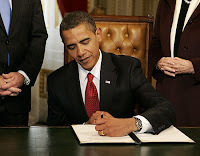 I just realized today that Obama is a lefty!